Royal Artillery Screw Gun and Martians!? This is a Royal Artillery 7-pound Jointed Rifled Muzzle Loading Gun (The Screw Gun). 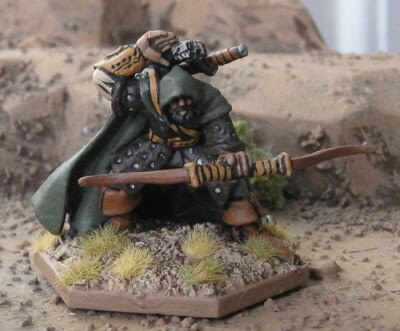 The model is from Connoisseur Miniatures – which are currently available from Bicorne Miniatures. These are two Space:1889 High Martians from RAFM. They’re actually meant to be flying and landed versions of the same Martian. I painted these up quickly, as one of the player characters in our new Space:1889 campaign (on Savage Saturday Night) is a High Maritian. I’ll be painting up the rest shortly as they feature as the baddies in a number of adventures. 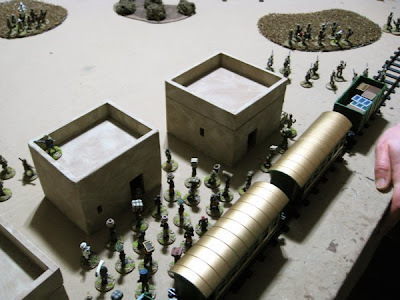 RAFM still produces a lot of cool Space:1889 Miniatures. On Saturday afternoon, after the previous evening's 7th Annual Wargaming Birthday Bash, I had a few o' the lads over to play Warrior Knights. I have decided that every month, for the rest of the year, I would set aside a Saturday afternoon to play a board game - as... well... I've picked up a few. I decided this month we would start with Warrior Knights. 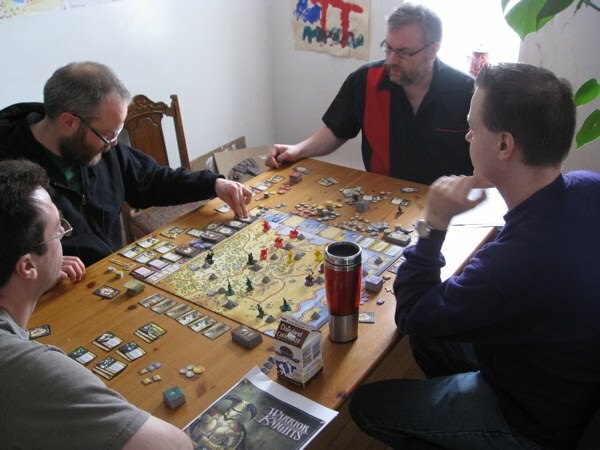 I think next month we'll try another FFG game; Age of Conan! I picked it up in December during their annual December Blow-out sale. 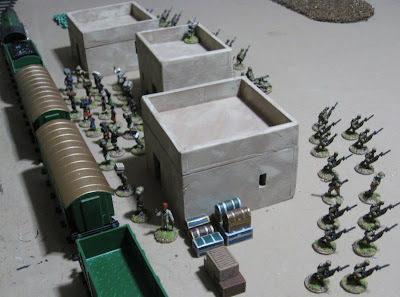 I remember the original GW game - never owned or played it - but I thought it looked really cool. When FFG re-released it I was pretty excited and... well... when they were selling them for $25... how could I pass THAT up!? Anyway... the game... As it says on the box... "The king is dead. The throne is left bloodied, without a rightful heir. As the land hinges on the brink of anarchy, six barons arise to stake their royal claim. Voices shall be heard, blades shall be drawn, and, eventually, a king shall be crowned..." As it turned out for our kingdom, only FIVE barons rose up to stake their claim. 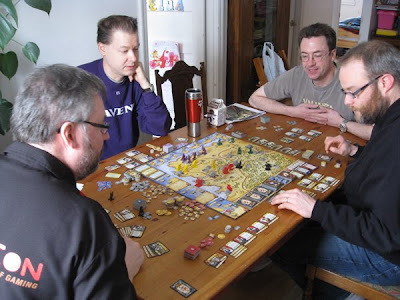 I played Thomas Edmund MAdder (red), Christian played Guillaume de Limon (yellow), John played Heinrich Otto Zobel (black), Other Tim played Umberto da Viola (purple), and Darrin played Raoul d'Emeralde. At the end of the game (which took just over 3.5 hours) Other Tim and I were tied for Influence, but I had one more cities - which, honestly, had more to do with the luck of where we set up (quite randomly) on the first turn... Christian said he didn't utterly destroy me because "it was [my] birthday after all" (thanks for that!). Last night marked the Seventh Annual Wargaming Birthday Bash. In attendance were John, Christian, Dave, Patrick, Rick, Jackson, and Gary. 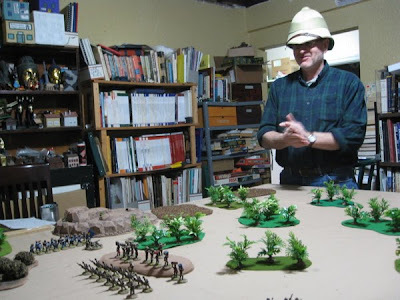 It worked out that the other John didn’t show as I had seven German units, which each of the other participants controlled, and I played the British! 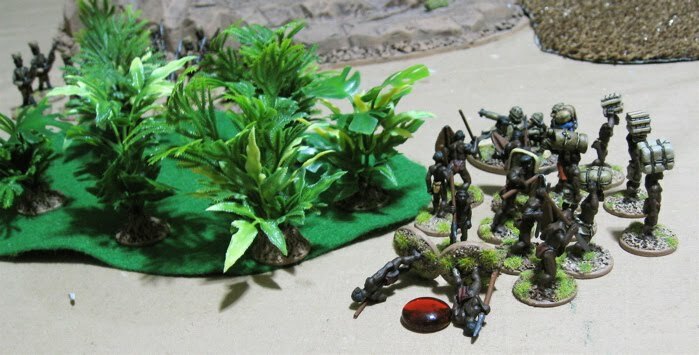 I made a few adjustments to the rules since our last play and am now calling them Ever Black Contemptible Victorious Little Powder Armies…. 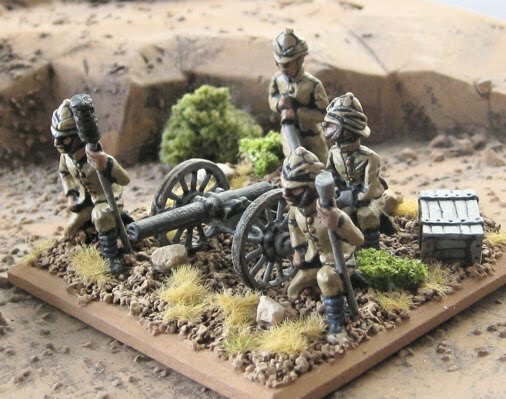 (John suggested it should be Black Contemptible Victorious Little Powder Armies of Doom…) either way.. a bit of a mouthful… I may need to think of something else. 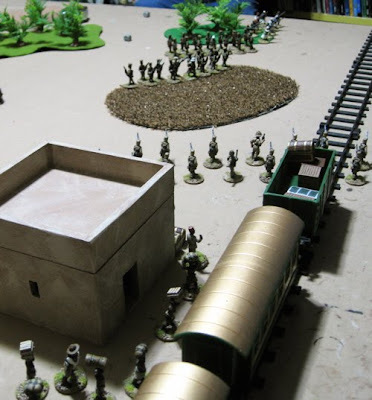 After the allied debacle at Boongobe, the German Field Force decided to press it’s advantage and carry on into British East Africa and raid the Uganda Railway station at Tantoone. 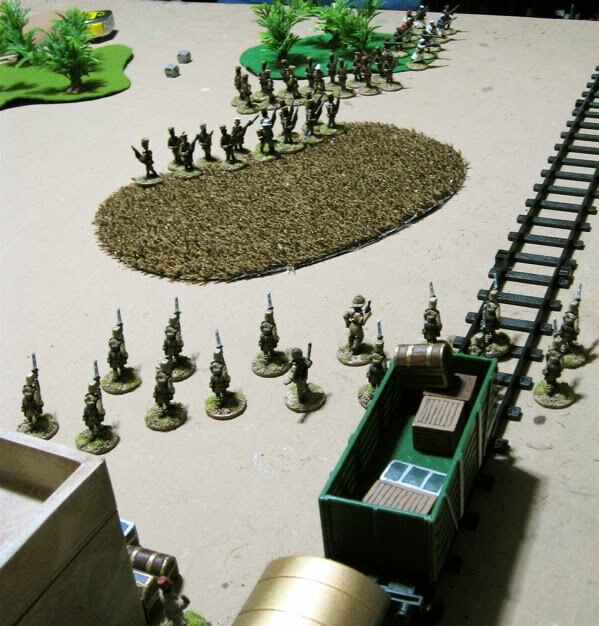 All the players command a single German unit. 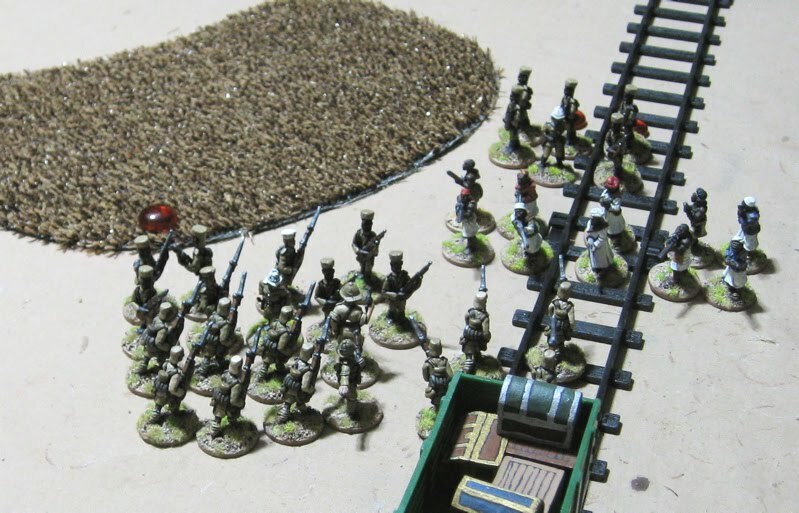 The player of the first German unit to contact the train is the winner! The Train won’t be staying there forever. After turn eight 2d6/d12? will be rolled if the dice score + Turn # = 20+ then the train has, finished loading, got up steam and rolled out of town. 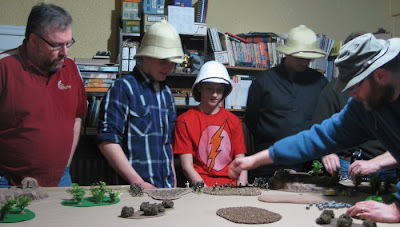 More of the same – with the British MG detachment and some local kids out to encourage them. 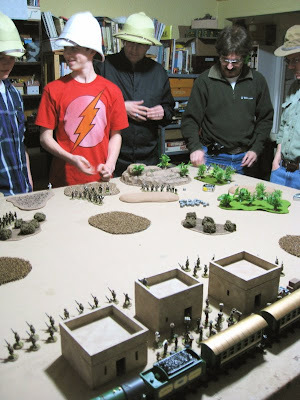 The players setting up their forces. … and they’re off.. On the far edge of the table from left to right are John’s Watusi tribesmen (top left, barely visible amongst the bush), Jackson’s Schutztruppe Askaris (in column behind the scrub), Patrick’s Schutztruppe Askaris (also in colum in the center), Christian’s German settler volunteers (in the tall grass behind Patricks Askaris), and Dave’s Schutztruppe Askaris (over on the right). 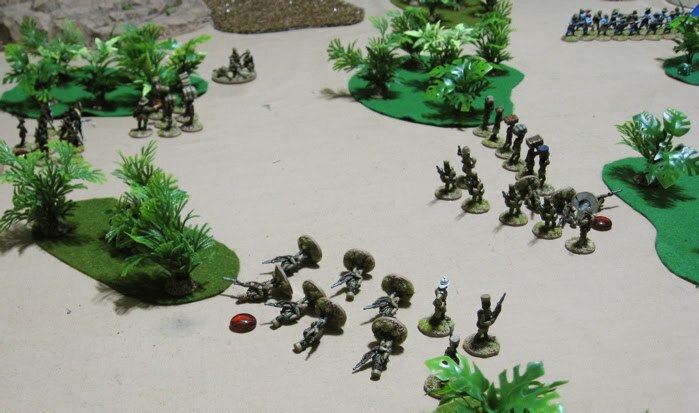 In the center Patrick and Jackson had advanced their Schutztruppe Askaris into some tall grass and then sat there trying to engage the KAR Askaris in a long-range firefight. Not something to do when the clock is ticking and you have a train to catch! My KAR and MGs seemed to be having better luck than they and whittled them down over a number of turns. 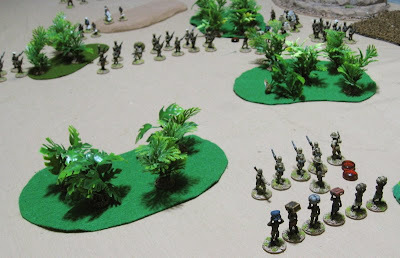 Christian also deployed his German big game hunters in the center and started sniping at the MG – which WAS a little more worrisome… but the Stalwart British hung on for some time plinking away at Patrick’s askaris. 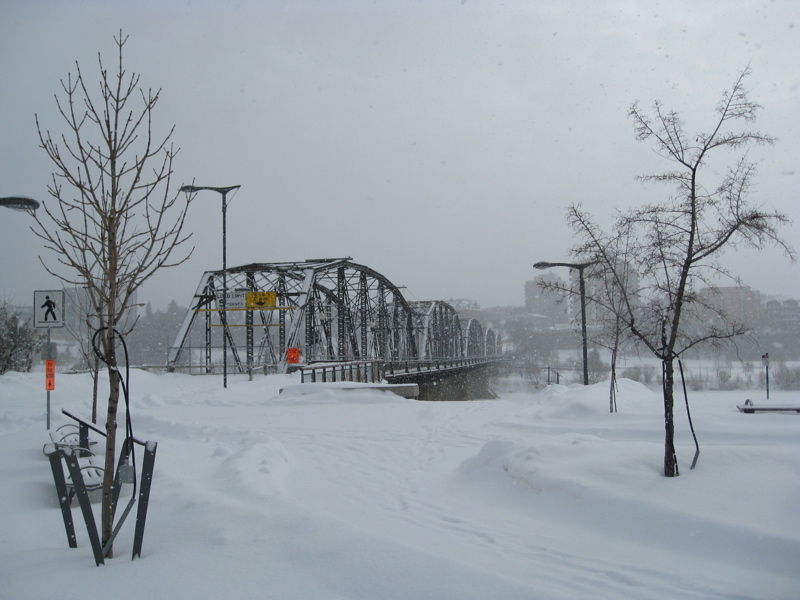 Getting closer…. At this point I started exchanging shots with Dave’s Askaris. John’s Watusi Tribesmen slowly making their way through the bush. 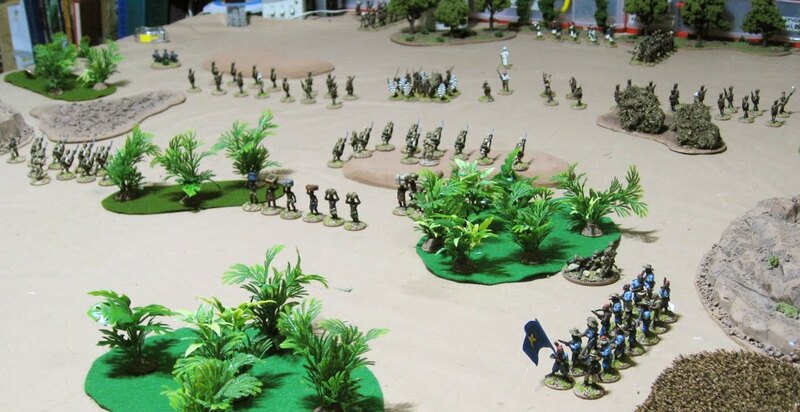 In the top left you can see Patrick’s askaris – now whittled down to half their original strength - at the furthest point their would advance in the game… for the remaining turns they sat at the edge of the tall grass exchanging fire with the British MG.
Rick’s Askaris were the first to take a run at the KAR defending that end of town. Dave’s had tried to get in there but just couldn’t make it. Due to some good shooting as they came in – combined with me rolling well on the combat and Rick rolling poorly – his askaris scarpered with their tails between their legs, short a few men and with a pair of moral failure tokens for their troubles. Jackson’s Askaris making their move at the other end of town. Unfortunately at this point they were already at 2/3 their original strength and had a moral failure token and no one around to rally them. Another shot of the action on the British right. John’s Watusi Tribesmen hiding in the bush waiting to make their assault on the town. The next turn (I think we were at about turn eleven or twelve and I was hoping for a high number on the Game End Roll – didn’t happen) – Gary’s Ruga Ruga made it in. 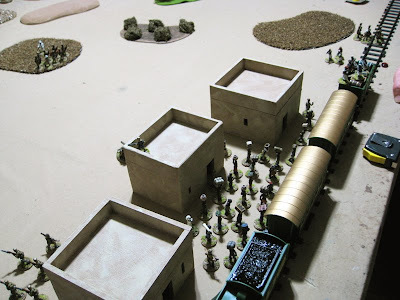 Major Percival Smythe-Brown desperately trying to get to his troops to rally them… failed in doing so and the shaken KAR askaris fled before the Ruga Ruga. 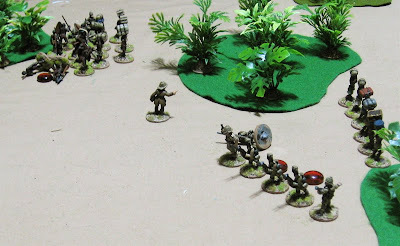 Jackson’s Schutztruppe Askaris took a beating when they emerged from their cover lost four and failed another morale test – they would be doing nothing for the balance of the game. 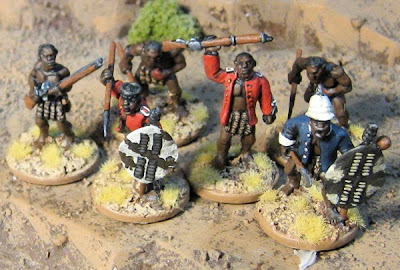 John’s Watusi Tribesmen emerged from their cover and, had there been another turn or two, would have caused the British much trouble over on their left!! Anyway – good fun. Despite the number of players and units involved the game took only a little over an hour…? Definitely liking these rules with the current tweaks. We’ll have to try addind some artillery and cavalry… then some airplanes and tanks, etc. 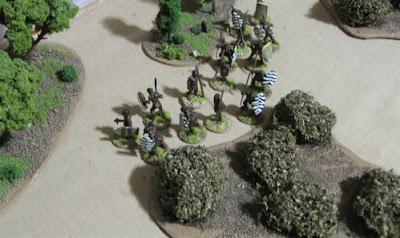 Pics of the Warrior Knight game… then maybe some ZULUS!! 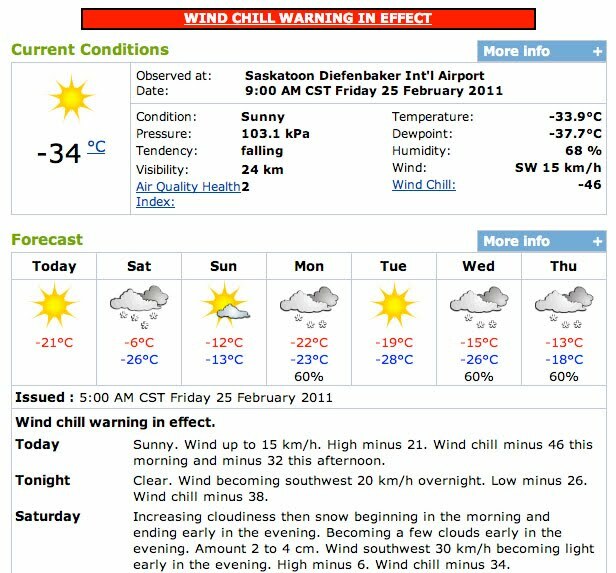 I know, I know… I said I was going to work on an entire unit…. But I got started on them and got wondering HOW white I should paint some of the white bits of their uniform…? 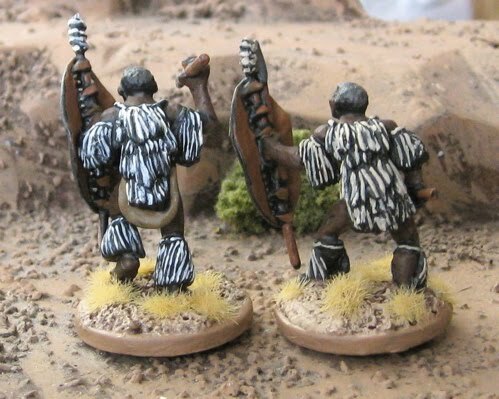 These two Zulus are from The Foundry. Honestly, I’m kind of torn… I like both of them for various reasons… (or perhapsI should say I don’t mind either…?) 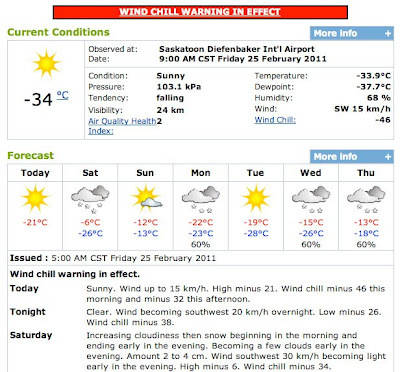 Anyone out there with strong feelings one way or the other…? I went and saw The King’s Speech the other night. I thought it was really quite well done. 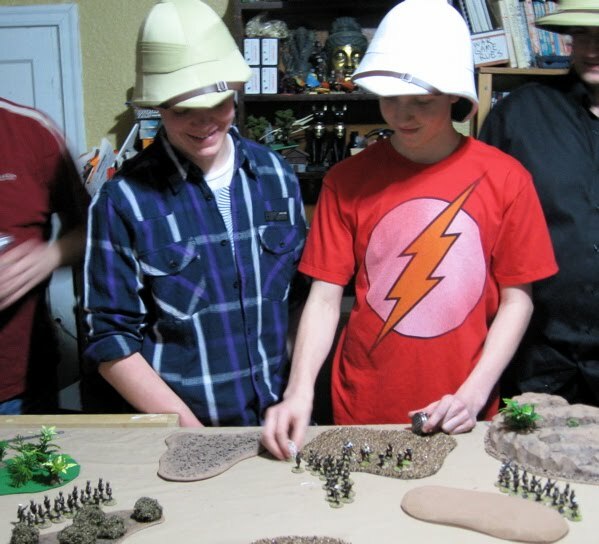 Of course it’s got me all fired up about the idea of doing some more “Very British Civil War”-gaming… Of course then I get an email that Maelstrom Games is having an anniversary sale and they just happen to have the VBCW books… at 15% off (with the voucher code: MAELSTROM-10 until Feb 28/11)… free shipping worldwide… ugh... I very nearly bought them… but then didn’t – I’ve spent nearly my entire years toy budget in the first six weeks of this year and might need those remaining nickels for… I don’t know… some Indian troops…? 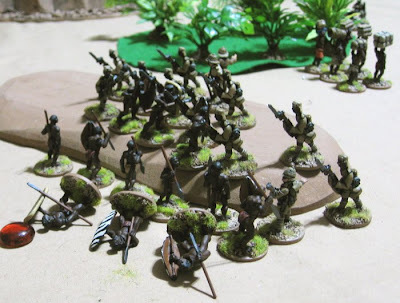 Maybe some mounted South African volunteers for the Zulu War…? Did I mention it’s my birthday this weekend…? These are from The Foundry. I don’t know why I keep doing ones in captured British uniforms…? 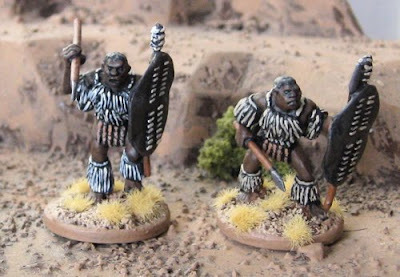 I’ve spent the last couple days basing and assembling and such and I have a unit of 20 Foundry Zulus ready to go, waiting close in the wings are two units of 20 Black Tree Zulus (one primed, the other not so much). I have a few more units of Foundry Zulus, but I need to manufacture spears for them, and I have a couple smaller units of foundry Zulus with firearms, mostly primed and ready to go… so far, including a dozen villagers, I think I have about 200 Zulus…and there should be another batch of 40 arriving in the next week or so. Next I’m going to try and do a whole unit of 20 unmarried Zulus (the chaps in the bottom left of the pic). 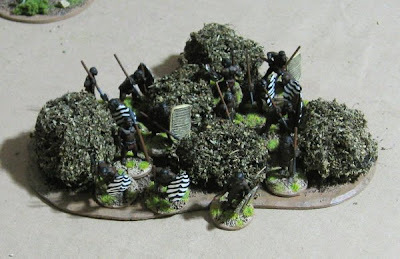 I had thought I’d finish off some Great War King’s African Rifles for my game on Friday… but I’m more excited about the Zulus at the moment and it’s always better to go with what you’re excited about! I do have a few RAFM Space:1889 Martians I could paint up… but I got thinking about what else I could use as “outer-space” aliens from the other worlds that could be explored? 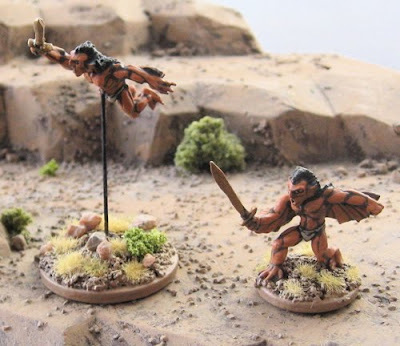 I figured, in the tradition of the original Star Trek's cheap props and aliens that all look vaguely human, I could totally use the fantasy Elves as the inhabitants of one planet... perhaps Dwarves on another... Orcs... Hobbits… etc... I could even take some spare ancient, dark age, medieval, ECW, fantasy, or… whatever… kind of human figures I have kicking around and paint them with blue or green or orange skin and bippity-bam – instant aliens!! 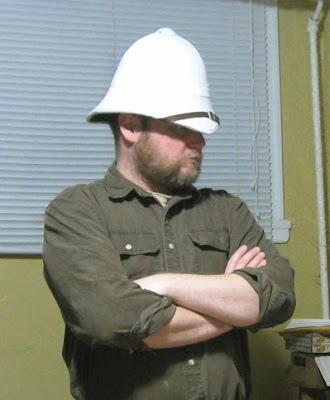 Zulus, hopefully… or maybe Martians and aliens, if I become COMPLETELY distracted!? I also have a few fantasy character types on the workbench that I’m painting for a friend’s D&D game. I’ll be working on those over the next week or so as well. 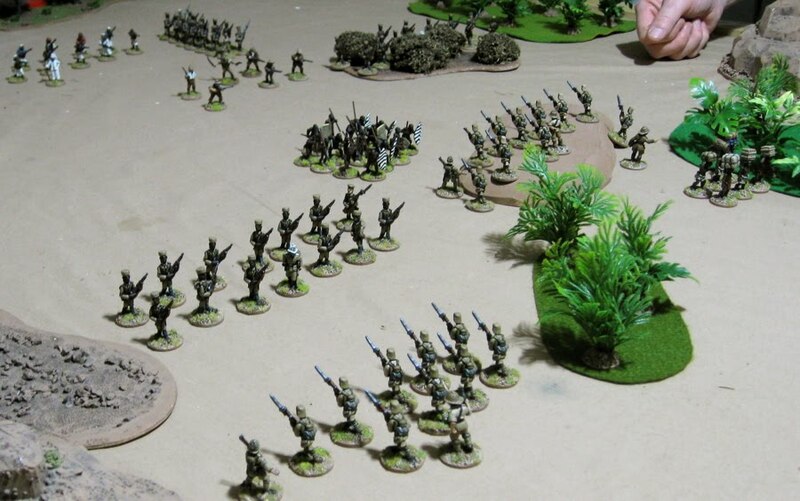 My friend John Bertolini popped by this evening to have a go at Ever Contemptible Armies (a combination of Ever Victorious Armies and Contemptible Little Armies – I like a lot of EVA and ECA just updates it a bit and brings it into the 20th Century with a few rules pilfered from CLA… and a few additions of my own…). A small group of British and Belgians have been on a raid into German East Africa at Boongobi. The raid did not go so well. 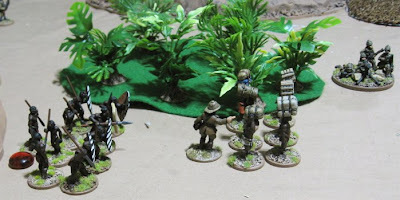 They met a German Shutztrupe Feldkomagnie they weren’t expecting to find and are now retiring back to their own base of operations with a large number of German askaris in hot pursuit! 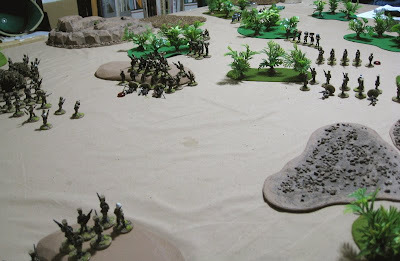 British and allied forces must attempt to retire their forces in good order off the far end of the table. 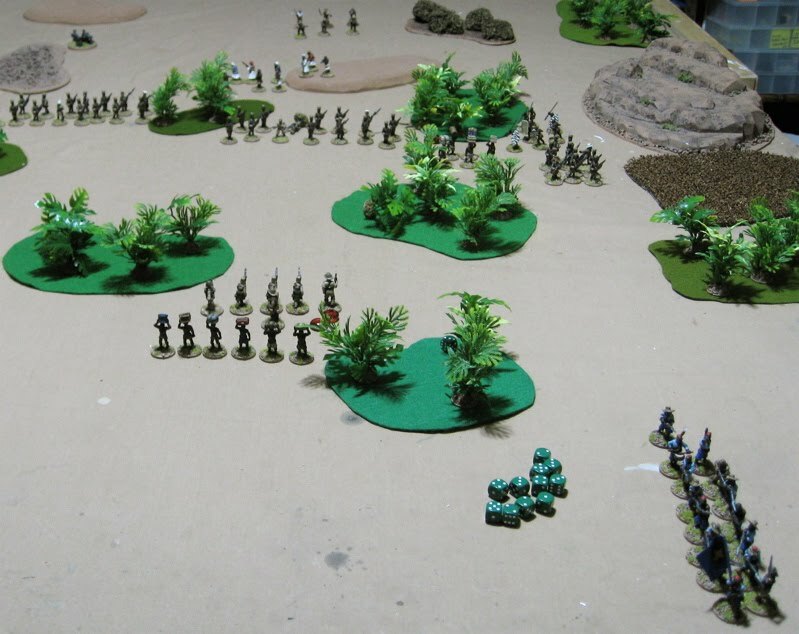 Allied forces must set up at least 4’ away from their escape edge (the green line). 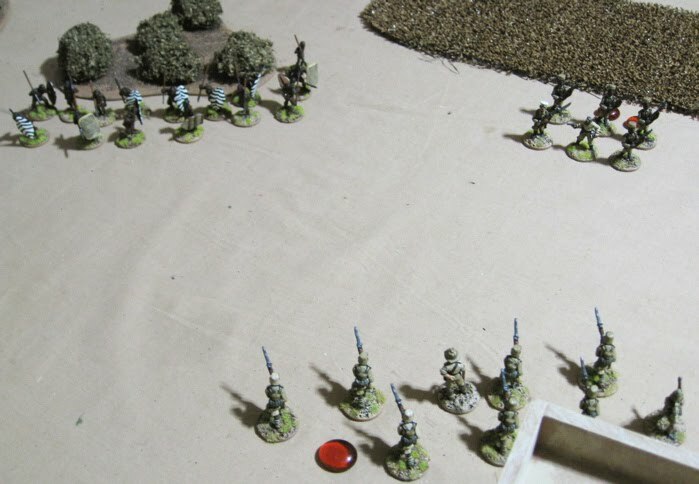 German forces set up at least 6’ from the edge (the blue line). 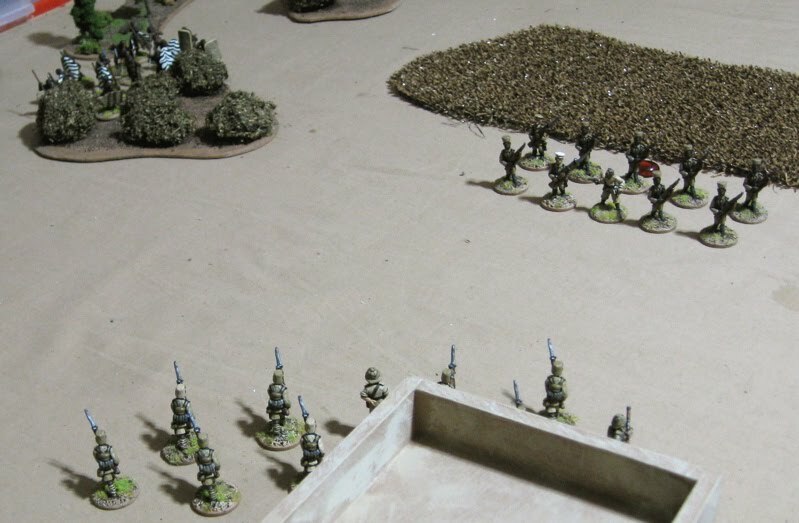 Three German units were to remain off table and enter from their table edge on the 2nd turn. 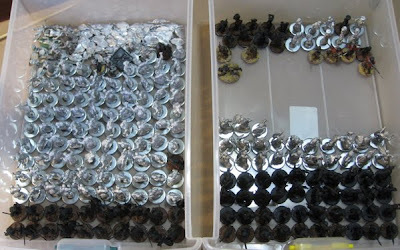 Victory will be determined by how many units the British and allies can get off the table edge. (for this purpose the teams of porters each count as a “unit”, as does the MG detachement). For every two German units lost, however, the number of British units required to escape off the edge for each level of victory is reduced by one. The Table. 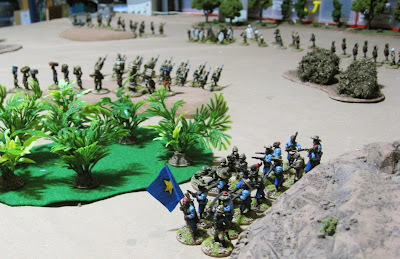 In the foreground are the forces available. In the background you can see the green and blue lines marking the British and German deployment zones. Initial deployment. Two of the Allied units started the game in columns, ready to make a run for the table edge. 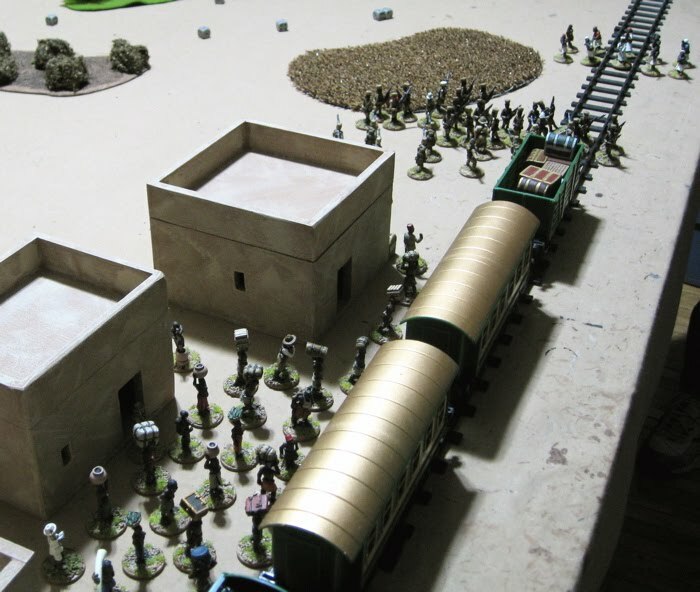 The entire baggage train was centrally located – where they could disappear behind a hill on the first turn (not that that mattered – they couldn’t be shot at only captured by contacting them). One platoon was held back deployed in skirmish order to try and stem the tide of advancing German forces. 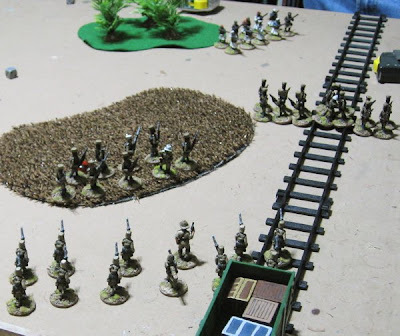 The Belgians and the British MG detachment making for the border – their baggage train slowly making their way over the hill. 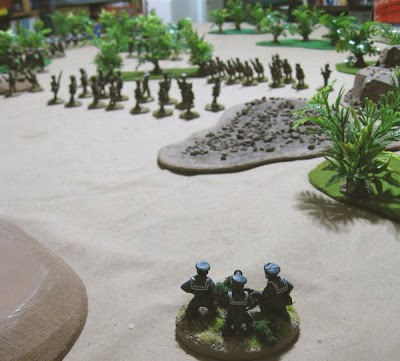 On that first turn some shots were exchanged between the KAR platoon left to delay the German forces and the German volunteer marksmen – both units lost one casualty. A unit of Shutztruppe shot up the other KAR platoon taking two off the end of their column. Hearing the shots whizzing past their head the baggae carriers picked up the pace (moving 5” and 6”, respectively). The KAR platon that had been in column quickly reformed into a skirmish line – realizing that in column they just weren’t going to get far enough, fast enough. 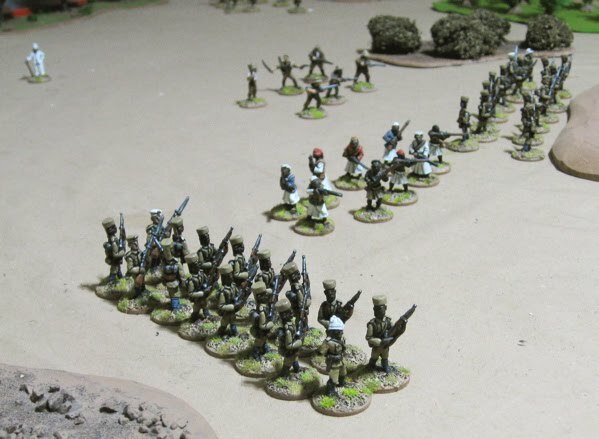 The rest of the German forces arrived – the regulars in column to make a speedy advance to the front. Two KAR platoons holding their ground and trying to shoot up the advancing German forces. 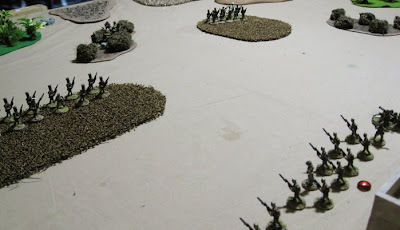 The German MG detachment got one turn of firing in all game and, I think, took out one or two KAR askaris. 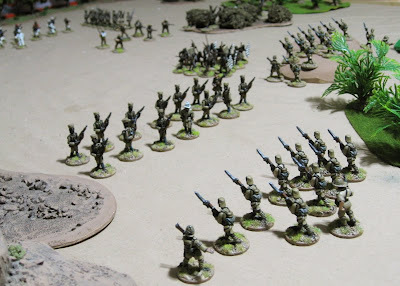 The German allied tribal warriors charge into the KAR platoon – though the KAR took a few out on the way in, they were overwhelmed and wiped out. 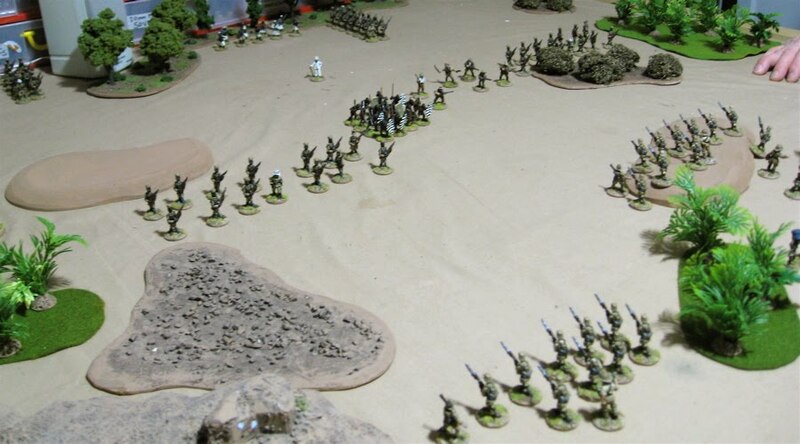 The other KAR platoon executing a fighting retreat with Shutztruppe askaris in hot pursuit – slowly they were picking away at each other. 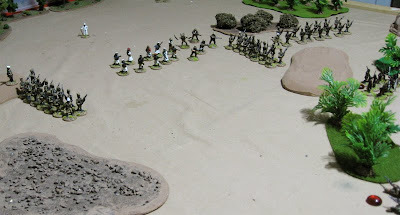 Then the Schutztruppe blundered into the field of fire of the British MG detachment and they were just murdered!! The rest of the German force making their way up. With the KAR platoon knocked out the tribal warriors pursued the slower baggage porters, while the rest of the force tried to catch up. 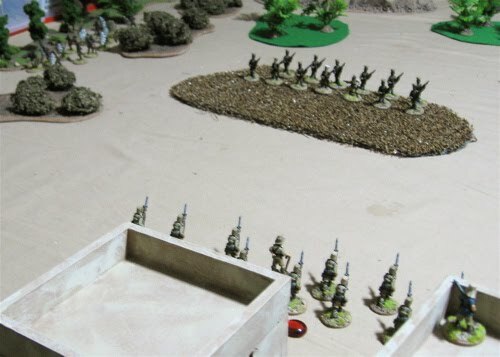 The Belgians did happen to exit the table having suffered no losses. The German forces second line moves forward. While the Tribesmen looted the Baggage, the British MG detachment turned to face another threat – more Schutztruppe askaris advacnign around the other side of the stand of trees. The MG took out three of the advancing Schutstruppe and managed to hold their ground and fight two rounds of close combat, but they too were eventually overwhelmed and lost. The scene when we called it. The Belgians were actually already off. John called it at this point. 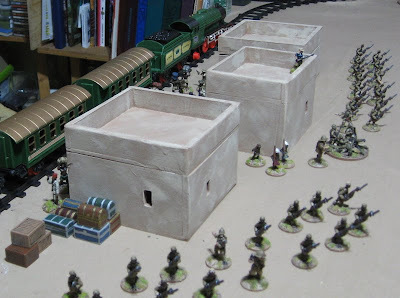 If he’d done enough damage to one more unit of Germans to make them route, and gotten the remaining platoon of KAR and the section of porters off he could have squeaked out a minor victory. He figured the fresh second line of German troops were a bit too close for that to possibly happen so we didn’t play it out. It was a VERY tough scenario for the British and allied troops. 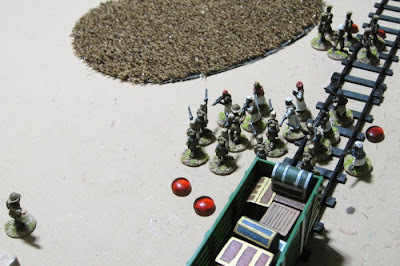 I have to fiddle with the morale system – units stayed on the field far too long (which has always been a problem with CLA..). Also if fully half of the German force had started off table and not arrived until the Third turn – I think he might have had more of a chance… I think we both had fun just the same. 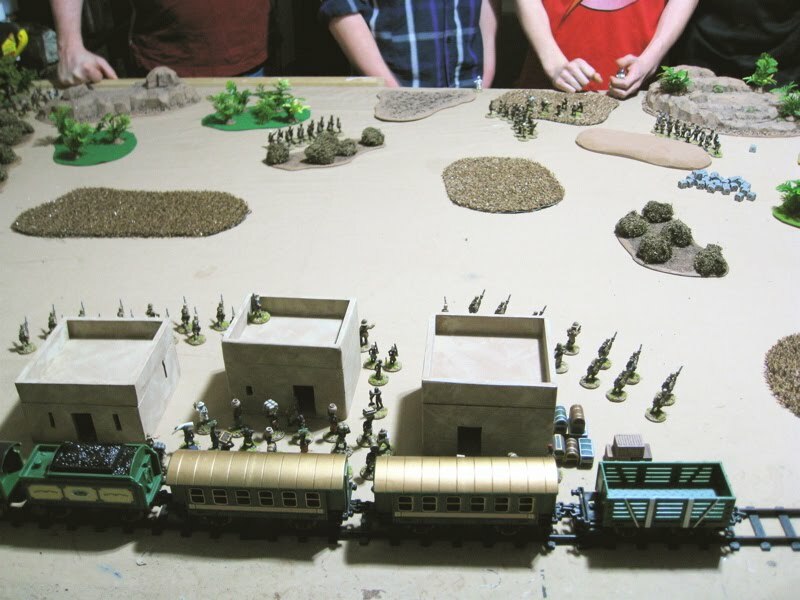 We’ll probably be playing something similar again next week at the 7th Annual Wargaming Birthday Bash!